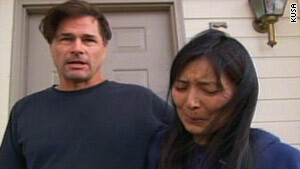 CNN has reported that Richard and Mayumi Heene, shown in this photo from last month pretending to be anguished about the fate of their son Falcon, who they said had accidentally flown away in a large balloon, are expected to plead guilty to charges that the incident was a hoax. Mayumi Heene, who called 911 to report the non-event, will plead guilty to a misdemeanor charge of false reporting, and Richard Heene is expected to plead guilty to a felony charge of attempting to influence a public servant. The Heenes' attorney said in a statement that the deal was partly fueled by the fact that Mayumi Heene is not a U.S. citizen, and so a felony conviction would have resulted in her deportation. "It is supremely ironic," he said, "that law enforcement has expressed such grave concern over the welfare of the children, but it was ultimately the threat of taking the children's mother from the family and deporting her to Japan which fueled this deal." Also fueling the deal: that they are guilty. Both balloon hoaxers could receive jail time, although their attorney said prosecutors had recommended probation. Hopefully the judge will also issue a permanent injunction forbidding the Heenes from appearing on reality TV shows in the future. I'm not sure that would be constitutional, but it also would not be high on my list of constitutional violations to worry about.